Volkswagen Group South Africa hosted its first ever Black-Owned Suppliers’ Day in Uitenhage in early May. Attended by the Minister of Trade and Industry, Rob Davies, and MEC for Economic Development, Environmental Affairs and Tourism in the Eastern Cape, Sakhumzi Somyo, the event presented a platform for 45 companies that meet VWSA’s stringent supplier criteria to profile themselves to the local automotive industry. “Volkswagen takes the issue of procurement from black-owned suppliers as a priority from both a moral and legislative compliance perspective. We understand government’s priority elements of the BBBEE codes and the drive for ownership. We, however, have difficulty complying with the Enterprise and Supplier Development element set out in the recently-revised BBBEE mandate. This is not because we do not want to, but because it is virtually impossible given the scarcity of black-owned suppliers to the local automotive industry. In our case, this is compounded by our high level of local content in the manufacture of Polo and Polo Vivo,” explained Schaefer. VWSA contacted over 100 organisations, ranging from industry associations, organised businesses, business support bodies and government agencies, to request assistance in compiling a list of potential suppliers. The contact list included companies from other industries such as Defence/Military, Agriculture, Mining, and Information Technology. As a result of this initiative, Volkswagen now has the first ever database of potential black suppliers to the industry and government agencies associated with the automotive industry. “The compilation of this list motivated us to organise this event in the hope of attracting new black- and women-owned manufacturing suppliers to help us meet, comply with, and earn the relevant points. Today is the start of a new beginning that will allow us to increase the spread of our own and the industries’ supplier base, as well as grow the number of suppliers that meet the BBBEE criteria for the Enterprise and Supplier Development element,” concluded Schaefer. A total of 430 companies applied to be part of the event, albeit mostly in the services sector. Applications were assessed against a set of criteria and finally only 45 companies were approved to be exhibitors of VWSA’s first ever black-owned suppliers’ day. Successful organisations had to have a minimum of 51% black ownership (includes Coloured, Indian and Chinese as per BBBEE guidelines) and/or a minimum of 30% black female ownership. Another key requirement considered by VWSA was companies that are owned or managed by disabled persons or war veterans. In his speech Minister Davies took the opportunity to compliment and thank Mr Schaefer and his team for their vision, for showing their commitment to transformation through action, and for providing insight into the challenges that the automotive industry faces in securing relationships with black-owned suppliers. One of the highlights of the day’s programme was a ministerial roundtable that discussed how black industrialists and black-owned suppliers could be assisted to be part of the automotive sector. The participants were: Minister Rob Davies; the CEO of the Black Business Council, Mohale Ralebitso; CEO of the Automotive Industry Development Centre, Dr David Masondo; and Philisiwe Mthethwa, the CEO of the National Empowerment Fund. 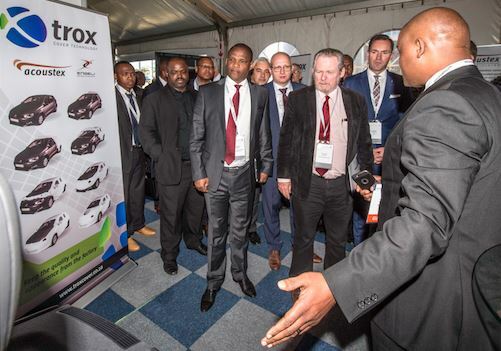 Other high profile guests included the chief executives of Toyota, Ford and Mercedes in South Africa, who used the opportunity to visit the exhibition together with other players from the industry and familiarise themselves with the potential future suppliers exhibiting on the day.